Update #2 Winter 2010/2011: Sometimes restaurants move to new locations, only to come back to the same spot a few years later. I went to Findlay's and they have the same tenderloin, and some good mac 'n cheese side too. You can buy smoked meats in bulk now. 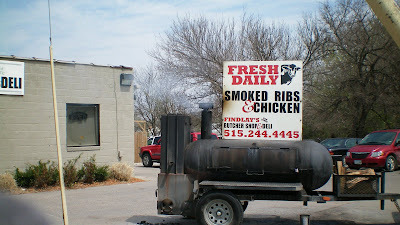 UPDATE: Findlay's moved to Knoxville in late 2009, they are just a block off the main square. I saw it was just a BBQ place with the same menu but no meat market. This current location is now named Two Rivers BBQ Market and Deli, they have a tenderloin but I haven't made it in try one yet. This butcher shop has a wide variety of meats for sale, and a lunch menu that includes a homemade tenderloin. The big meat smoker outside told me that tasty meat would be served here. Unfortunately, subsequent visits have revealed the tenderloin is no longer on the menu. Bummer. Location: 1951 Indianola Ave on the south side of Des Moines. Directions: Take south 7th St. from downtown, turn on Indianola and find this building beside Italian-American cultural center. 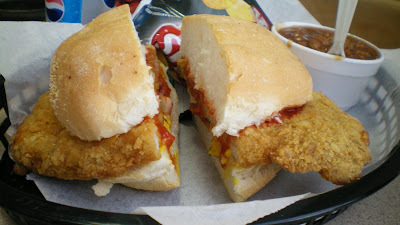 The Tenderloin: The first thing I notices was the three-point shape of the meat. The dense, chewy consistency of the meat and exceptional pork flavor makes me wonder if this was slow cooked before breading. Dollops of mustard, ketchup, and red onions are between the bun and the tenderloin. Served on a soft but cold kaiser bun from a local bakery. Overall a solid 7.5 out of ten. Price: 4.99 , with chips and a side for $1.50 more. Also on the menu: Smoked meat BBQ sandwiches, a full meat selection for large orders including Turducken. Jerky was in stock when I stopped by. Service: Counter service, it can take a few minutes to get your food. Ambiance: Bright light from windows comes into dining area. There are signs with meat prices outside. The place gets crowded for the lunch rush. Final Thoughts: Smoking the pork loin before breading and frying can bring out a world of flavor. This relatively new butcher shop has a solid tenderloin worth checking out, its too bad it was discontinued or moved to "seasonal" status. For emergency Tenderloin craving: head further down Indianola and turn on Hartford to reach B&B Grocery for their Big Piggy Pork Loin or Real Tenderloins. 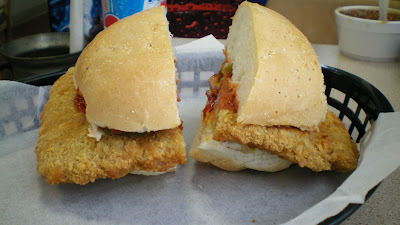 B&B Grocery definately has great breaded pork tenderloin sandwiches. 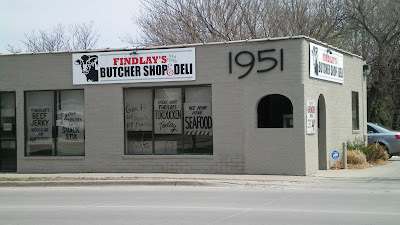 They're just a stone's throw (okay, maybe a little farther) away from Findlay's. Definately worth the extra drive if you wanted a tenderloin sandwich. I try to eat at Findlay's once a week. The tenderloin is by far not the best thing they have. 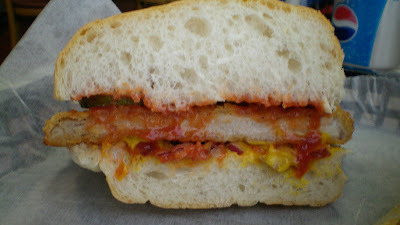 Plenty of other sandwiches to choose from. I just ate a smoked half chicken meal, comes with beans, slaw, and a roll. I am full. Also, best beans i have ever eaten. I'm afraid Findlay's closed sometime not sure when as I haven't been by there in Months. They had the best beans ever, I agree with the other poster! Its opened as another meat shop but I didn't stop in to check it out. There is a sign in the window saying that they are returning to their old locaion. I am not sure when they will be open, but they are coming back to DM! They've been open for a month (or two?) now - head out there! I stopped by to pick up some smoked brisket to take home, and when I got home I found that they'd sauced it!!! Why in the world would they do that without asking? If their brisket is good shouldn't need sauce.